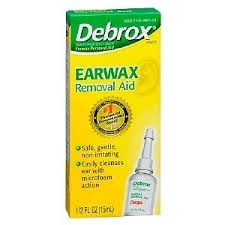 For occasional use as an aid to soften, loosen and remove excessive earwax. Used as directed, cleanses the ear with sustained microfoam. Provides a safe, non-irritating method of softening and removing earwax. Note: Oversize package for ease in reading label information. Adults and children over 12 years of age: Tilt head sideways. Place 5 to 10 drops into ear. Tip of applicator should not enter ear canal. Keep drops in ear for several minutes by keeping head tilted or placing cotton in the ear. Use twice daily for up to four days if needed, or as directed by a doctor. Any wax remaining after treatment may be removed by gently flushing the ear with warm water, using a soft rubber bulb ear syringe. Children under 12 years of age: consult a doctor. Products foam on contact with earwax due to release of oxygen. There may be an associated crackling sound. Keep tip on bottle when not in use. FOR USE IN THE EAR ONLY. Ask a doctor before use if you have: ear drainage or discharge, ear pain, irritation or rash in the ear, dizziness, an injury or perforation (hole) of the eardrum, recently had ear surgery. Stop use and ask a doctor if: you need to use more than four days; excessive earwax remains after use of this product. When using this product avoid contact with the eyes. Keep this and all drugs out of the reach of children. If swallowed, get medical help or contact a Poison Control Center right away.